Tópico em '2016' criado por martec em 29/06/2015, 00:05. 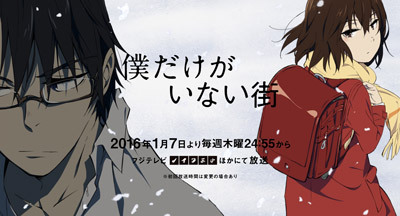 Sinopse MAL: Struggling manga author Satoru Fujinuma is beset by his fear to express himself. However, he has a supernatural ability of being forced to prevent deaths and catastrophes by being sent back in time before the incident occurred, repeating time until the accident is prevented. One day, he gets involved in an accident that has him framed as a murderer. Desperate to save the victim, he sends himself back in time only to find himself as a grade-schooler one month before fellow classmate Kayo Hinazuki went missing. Satoru now embarks on a new quest: to save Kayo and solve the mystery behind her disappearance. Trailers são enganosos, mas espero algo muito bom desse. Gostei do plot inicial, tomara que tenha uma boa execução. 12 episódios. O anime será filantrópico logo será vendido em boxes. De acordo com o trailer parece ser interessante. Espero que supere minhas expectativas. Não tem OP nem ED no episódio. Um download desperdiçado, já apaguei o arquivo.